In 1978, thirty years after Apartheid was officially established by the National Party, the South African government faced a political scandal over a secret propaganda war that was designed both to influence local public opinion and rebrand the racial institution at international level. Exposed by two Rand Daily Mail journalists, the Information scandal was nicknamed ‘Muldergate’ by reference to the early 1970s’ Watergate revelations that lead to Richard Nixon’s resignation. Nowadays, the political masterful manipulation would have been better described with the 2017’s word of the year ‘fake news’. With the ANC in exile, ‘the issue of culture began to rise steadily in prominence within the movement, particularly in the 1980s. This intensifying interest in culture saw rising numbers of workshops, festivals and seminars devoted to the issue, interviews and public pronouncements by leading ANC figures, and the high-profile Culture in Another South Africa (CASA) conference held in Amsterdam in December 1987. As the end of Apartheid approached, lawyer and activist Albie Sachs’s thoughts on ‘Preparing Ourselves for Freedom’ started with the controversial proposition of reconsidering ‘culture [as] a weapon of struggle’, stressing his concern on how art could address the new political era. To what extent has the freed South Africa emerged as a changed society in the 21st century? A report published by the World Bank in March 2018 reveals that South Africa is one of the most unequal countries in the world. This report is an analysis of South Africa’s progress in reducing poverty and inequality since 1994 : while poverty levels are lower today they still remain high, wealth inequality has been rising and consumption inequality has increased. Moreover, ‘poverty levels are consistently highest among female-headed households, black South Africans, and children below the age of 15 and these groups tend to have a higher risk of falling into poverty’. 24 years after the advent of democracy, a ‘post-apartheid apartheid’, as some have dubbed it, has somehow emerged. Within this context, has culture been re-reconsidered as a weapon of struggle? Have conceptions emerged of what culture’s role should be both in external critical information work about this ‘post-apartheid apartheid’ and in internally focused work of nation-building? In the 2010s, events such as Nelson Mandela’s death and the Marikana massacre have been catalysing anguishes about the fabrication of national narratives, icons and images. This has led to a partial deconstruction of representations as carriers of colonial and apartheid ideologies, or post-apartheid ideologies pertaining to a ‘rainbow nation’ perceived as a construct. In what is sometimes referred to as the post-post-apartheid era, what role can and should the media play in the depiction of South African realities, in South Africa and abroad? In parallel, social media have begun to transform the relations between images, information and audiences. As social media shaped the way student movements shared information to local communities and to the world, new modes of production and distribution of filmed images have emerged, for instance with the form of the web-series. These new developments interrogate the relations between media: what current interactions between the press, social media and visual media (photography, videos and films in particular) do we need to analyse in order to make sense of the evolving relation between the spectacular, the informational and the ideological? In the age of fake news, we need to reflect on intermediality or the intermedial, broadly understood as ‘configurations which have to do with a crossing of borders between media, and which thereby can be differentiated from intramedial phenomena as well as from transmedial phenomena (i.e., the appearance of a certain motif, aesthetic, or discourse across a variety of different media). We encourage papers from all disciplines, which propose to articulate the concept of intermediality in their studies of events and representations. Researchers are invited to send a 300-word abstract and a short bio-bibliographical notice to confrsa11january2019@gmail.com before 31 October 2018. The attached .pdf document includes the full CFP. If possible, please forward it to any colleagues who may be interested. The redefinition of the Gothic in the late 20th and early 21st centuries. The portrayal of late 20th and early 21st century society from a Gothic perspective. Gothic rewritings of classic works. The Exotic Gothic: alternative readings in the global south. Transgression (in relation to identity, interpersonal contact, the social sphere…). Modern individual or collective identities in Gothic fiction and film. The deadline for the submission of proposals (in English or Spanish) is November the 9th, 2018. A selection of papers will be included in an edited book or journal. Abstracts (between 300-400 words) stating the name, address and institutional affiliation(s) of the participant(s) should be sent via e-mail, together with a separate biodata (about 150 words), to jmvillar@ucam.edu. in sincere penitence for the wicked lives we have lived. Is there any variation in the way female and male criminals were portrayed in those days? May the press and literature, and even some contemporary historians, have distorted the representation of female criminals? Context and aims: The problem of “corruption” has proved decidedly more tenacious than post-war theorists of modernization had once predicted. This much is evident globally, where corruption constitutes one of the most pressing problems facing emerging democratic states; but it is also evident in established, Western-style democracies, which remain gripped by recurrent scandals regarding the abuse of public office and widespread concerns about the decay of public life. Scholarship on corruption has flourished; and although much of this has focused on the present, historians have begun to grapple afresh with its multiple manifestations and meanings in the past, reaching back to the early modern period and beyond. This conference seeks to revisit the wide-ranging struggles against corruption in Britain during the period c. 1780 to 1940, ranging from the conduct of ministerial office and central administration to parliamentary, electoral and local government reform. The period is still considered crucial in terms of the demise of forms of corruption inherited from previous centuries—“Old Corruption”—and more broadly Britain still holds a pre-eminent place among those nations that first embraced modern values of public service and accountability. Yet, beyond the struggles to enact particular reforms and their peculiarly British realization, it is also clear that the very meaning of “corruption” was transformed in the process, as new problems, anxieties and scandals arose regarding the boundaries between the public and private interests of ministers, officials, councillors and MPs—and all in the context of an emerging market-driven, “mass society” that was at once more bureaucratic, democratic and industrialized. Arguably, the problem of corruption was less conquered than refashioned and revitalised, opening up a culture of public vigilance, suspicion and even cynicism that still prevails today. Format and themes: This will be a two-day conference: 24-25th January, 2019, held at Oxford Brookes University and is supported by Newman University, Birmingham, and the History and Policy Unit, King’s College, London. The deadline for the submission of abstracts is 29 June 2018. Alternatively, if you are interested in attending as a delegate please email to reserve a place. This proposed international conference aims to respond to the current state of world affairs: notably, the inherent ontological vulnerability of life and the economic, socially-conditioned precariousness of individuals, societies and populations, which have been heightened since the 2008 financial crisis. Caused by an economic shift in the labour market and global neoliberal capitalism, precarity has been increasing due to world-wide inequality as “more extensive and less visible patterns of global dispossession” and “relatively unstable and dispersed conditions of deprivation and insecurity” gain ground (During 2015). The conference will consider issues related to the diverse forms and experiences of precarity from a global perspective with special reference to South Asia and India. Contributors are invited to examine contemporary literary, visual and textual productions for evidence of how states of precarity are being identified or imagined, and how civic, economic, and philosophical structures and their alternatives are given new narrative expression. New and revised modes and genres of fiction, poetry, non-fiction and visual culture that are constitutive of the current climate and provide cultural responses to the “precarious society”, acknowledging or challenging its imperatives, will be key areas of enquiry. In assessing the impact of textual representations of precarity on cultural perceptions, you may also wish to reflect on current political, social, economic and cultural discourses, and identify resolutions, reconciliations, and alternative world scenarios that challenge precarity, referring to models of resistance, resilience and healing. Critical analysis of the political power structures that distribute precarity and cause economic deprivation attribute these conditions to structural inequality, lack of agency, reduced access to rights and capabilities, and social exclusion. Responses to such analyses may draw on case studies of socio-political and environmental marginalisation: e.g. the refugee crisis, terrorism and insurgency, planetary degradation, economic stagnation, redistribution of wealth, social injustice. Mainstream theorisations and framings of precarity such as Judith Butler’s (2009) may also be challenged or interrogated by drawing on decolonising perspectives such as Stef Craps’s (2013) revision of trauma studies, Sunera Thobani’s (2010) and Ida Danewid’s (2017) critiques of “imperial precariousness” as “white innocence” and “western supremacy” and studies such as that by Ella Harris and Mel Nowicki (2018). In taking up established and revisionary critical positions, this three day conference aims to interpret precarity through the optics of postcolonial, feminist and globalisation studies that foreground racial, gender, or class discrimination, and acts of silencing, censorship and marginalization by governments, corporations or other forces that lead to socioeconomic deprivation, violence and terror. Interdisciplinary approaches drawn from cultural studies, globalisation and postcolonial studies, philosophy, law, and history, and that refer to theoretical critical paradigms (e.g. gender, race, indigenous, feminist) are particularly welcome. Craps, Stef. 2013. Postcolonial Witnessing: Trauma out of Bounds. Palgrave Macmillan. Danewid, Ida. 2017. “White Innocence in the Black Mediterranean: Hospitality and the Erasure of History.” Third World Quarterly 38 (7): 1674—89. During, Simon. 2015. “From the Subaltern to Precariat.” Boundary 2 42 (2): 57—84. Harris, Ella, and Mel Nowicki. 2018. “Cultural Geographies of Precarity.” Cultural Geographies 1(5). Thobani, Sunera. 2010. “White Innocence, Western Supremacy: the Role of Western Feminism in the ‘War on Terror’.” In States of Race: Critical Race Feminism for the 21st Century, edited by Sherene Razack, Malinda Smith, Sunera Thobani. Toronto; Between the Lines, pp. 127-146. The registration fee includes seminar kit, breakfast, dinner and high tea for all three days. The University can help participants in getting concessional accommodation in The Courtyard hotel, on its campus. Please visit the Conference website for more information no Conference themes, important dates, fees, etc. 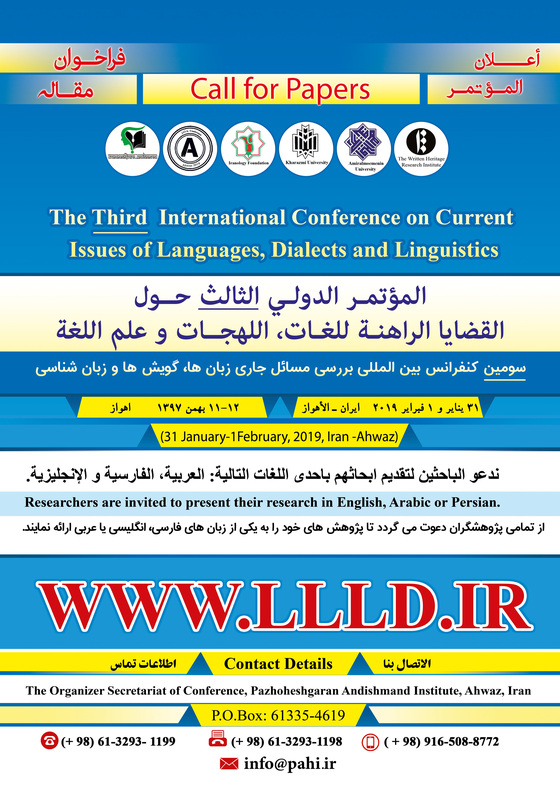 Academics and university lecturers are cordially invited to present their research in English, Arabic or Persian. Such an approach suggests that a linguistic study is no longer limited within a certain field; knowledge from different fields cultivates diversity in linguistic study. Recognizing this trend, the conference organizing committee aims to provide a platform for researchers and scholars from various fields to exchange ideas. The selective full papers of the conference will be published as the book of conference and also will be indexed in CIVILICA (however, the book of abstracts will be published too). A) Free Accommodation: ((1) accommodation will be in the university hostel or guest house, (2) Accommodation will be for four days (30th & 31st January & 1st & 2nd February 2019, Wednesday, Thursday, Friday, Saturday). (3) Three or four participants will stay in each room). B) Free Transportation: All transportation from Ahwaz airport to the accommodation place, to the conference venue and vice versa will be free. C) Free Food: During 31st January & 1st February 2019 (Thursday, Friday) lunch and dinner will be free. D) Free Tour: One Day Shoustar Historical City Tour – 2nd February, 2019 (Saturday) will be free. E) Other Notable Free Services. For the last year, the articles were received from more than 30 countries. Please feel free to write if there is any query. The James Joyce Italian Foundation invites proposals for the Twelfth Annual Conference in Rome. It will be hosted by the Department of Foreign Languages, Literatures and Cultures at the Università Roma Tre, to celebrate Joyce’s 137th birthday. As Giorgio Melchiori highlights in an essay entitled “The Languages of Joyce” (1992), “the whole of Joyce’s works, from Epiphanies to Finnegans Wake, is a great feast of languages of which we are asked to partake”. Language is not only a central theme in Joyce’s oeuvre, but also a biographical leitmotif, a site of symbolic power and a means for artistic creation. We invite scholars to send proposals for a 20-minute contribution. The conference will be the occasion to present unpublished papers and works in progress on Joyce to an international audience. The Conference includes a Joycean birthday party. Deadline for proposals: November 25, 2018. Accepted speakers will be notified by December 16, 2018. Key note speakers will be confirmed in September. On arrival, participants will be expected to sign up for membership of The James Joyce Italian Foundation (Students: 30 Euro; Individual Membership: 45 Euro; Institutions: 50 Euro; Supporting members: 70 euro).